Early last March, I bought a book and some yarn at the local yarn store that's just over an hour away from my home. This was not an impulse purchase. The book alone cost $45 plus tax, and I'd been browsing it since I first caught sight of it in 2002. It contains a lot of inspiration, and this time one of the ideas suddenly struck me as immediately useful (“immediate” in knitters' time-sense, which sometimes in my case seems akin to geologic time). I like to look at wonderful designers' work to get ideas for my own. 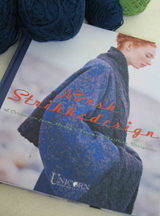 Norsk Strikkedesign: A Collection from Norway's Foremost Knitting Designers contains a heap of cool stuff to stretch the imagination—although in the case of the sweater I'll discuss here, my stretching has been relatively minor. I'm staying quite close to the original design that sparked the piece of work I'm picking up again after a summer-long hiatus. I say “quite close” even though I am using different yarn at a different gauge, have made color adjustments, have shifted from pullover to cardigan and thus also need to alter the neckline and collar treatment, intend to completely change the upper body patterning, and may revise the construction of the sleeve/body juncture (although I haven't decided yet exactly what changes in the sleeve/body set-up I'm going to make, nor have I designed the neck finish). The original is a pullover. I intended to make a jacket-like garment that would be fun to knit and would end up going with both my black business-travel basics and my everyday jeans (home-office dress code). I like to jolt the blacks out of boring. When I wear jeans, I like to look more dressed up than I am. Those are the goals of this project. The styled photo of the sweater gave me an idea about how to combine the black and blue functions, which are often at odds with each other in my closet. Isn't this a lovely way to balance those conflicting requirements? And wouldn't something along these lines liven up a dull travel wardrobe, or make a t-shirt and jeans look respectable? However, this photo leaves a lot to the imagination about how the garment has been constructed. A tiny inset on another page does show the collar detail (which won't work for a cardigan). And the full-size charts do show the basic shapes of the knitted pieces. I'll talk more about the charts later. Mostly, the book's visuals for this garment offer intriguing concepts for combining colors and patterns. That's design. That's the spark. That's what I launched from. That's the gift Lise Kolstad Yuen conveyed across the globe by participating in this book, the gift that all the people who worked on the book and made it available in English passed along. I began to consider the changes I would need to make in order to produce the sweater I wanted. I'd need a front opening, of course! Fortunately, I like steeks. I like them so much that although I don't teach very often (limited time), every year I do teach a couple of workshops with the goal of getting people over the first-steek hurdle. I would change the yarn to what I could find, and therefore I would almost certainly be changing the gauge. I'd need a different collar. 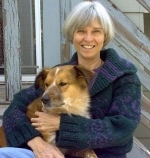 The pullover's collar is a semi-shawl construction (it stands upright, but would be a foldover-style shawl collar if you kept knitting a while longer). It's a great touch on the pullover. However, the ends are overlapped and stitched in place right across what would be the front opening of a cardigan. I sat on the floor of the yarn shop playing with colors from the abundant selection offered by Cascade 220, which is an affordable and dependable yarn that comes in the broadest range of colors I've found this side of a dyepot or fiber-blended handspun. Often these days I have to choose between editing a book and taking time for the dyepot or fiber blending. The book almost always wins. Black was a given, and I found a blue that I liked—baselines covered. I decided that a red would also be a good foundation color, as on the original, and after swapping a number of alternatives in and out of my collection on the floor, I located a shade that worked. It's darker than the red in the photo but contrasts well enough with the black to work for the lower-body patterning. If I'm going to knit that much pattern, it needs to be discernible. The combination of oranges in the narrow bands is part of what makes the original color-set exceptional. I wanted to preserve that unexpected touch of brilliance without using orange. After swapping more skeins in and out of my “thinking pile,” I ended up with a sharp green and one of its darker, mellower cousins. I left the store with the book that started all this and a bag full of yarn. 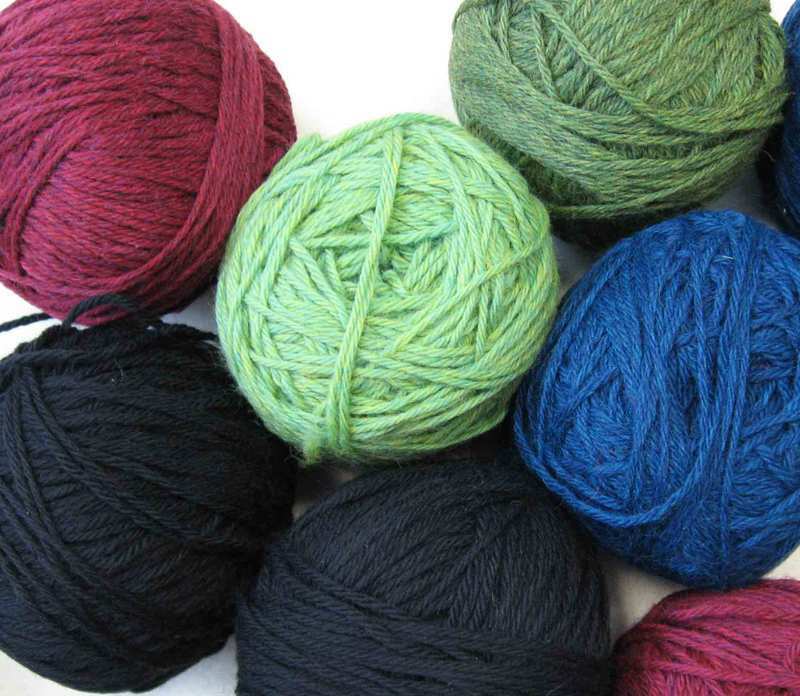 While waiting for my daughter to finish with the appointment that was our excuse for being in the city with that particular wonderful yarn shop, I sat in the car and began to wind the skeins into balls. Ball-winding makes space for pondering—it provides unscheduled but productive moments in which to contemplate sweaters-to-be, the work that's on the desk at home, the meaning of life. I like to travel with a nostepinne. Although I have the necessary speed-winding tools at home (and many shops, including the one I'd just left, now offer to wind newly purchased yarn for customers), I often choose to wind yarn into balls by hand. Whenever I happen to need a ball of yarn and don't have a nostepinne handy, I'll wind one onto whatever is an appropriate size and shape—empty t.p. roll, neck of glass bottle, any cylinder of useful dimensions and weight. Yarn is pure potential, and as I roll it into a sphere it passes through my fingers like dreams of a perfect future. At home with my resources, I began the labor of extracting the color patterns from the book's charts. First challenge: the charts for this garment have been printed at about 29 stitches/inch. Imagine that. Yes, the whole chart for the sweater front fits on a single page, and that's why each stitch is about the size of the tip of a 1.75-mm (U.S. size 00) Inox double-point. Each column or row of stitches is fractionally larger than the diameter of a .75-mm Lacis lace needle (U.S. size 000000, or as I say when I'm talking to myself, which is frequently in cases like this, “six-aught”). I understand this chart-sizing dilemma from the book-production perspective. From the knitter's perspective, it's nearly a detour off a cliff. If stitch size had been the only issue, I could have enlarged the charts on a photocopier. Several sheets of paper and a bunch of tape later, I would be ready to . . . well, not cast on but at least see what the pattern-repeat units were so I could start the calculations to convert to my gauge. Second challenge, and the larger barrier to swift knitting: the charts are printed in colors that, except in the narrow horizontal bands, have no reasonable contrast to each other. Enlarge one of these charts on a photocopier and you end up with a black blob the size and shape of the entire chart, with a slight flicker of variation where the narrow bands are. The photo below shows the sweater parts as they stand today, with as much visual interest as the charts would have provided if I'd photocopied them to work from. I was going to re-shoot this picture but the light's as bad today as it's been all week. There are better detail shots of the sweater later on. The charts were not as easy to transform into legibility. 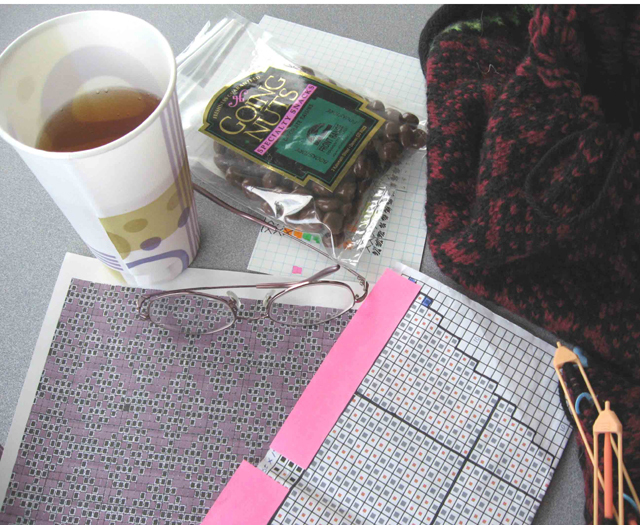 Because I could see the narrow-band motifs at the bottom and across the chest clearly enough with standard bifocals, and because a narrow-band motif was what I would need first when I started the patternwork, I began there. I drew those patterns directly onto graph paper. The lower-body patterning . . . well, I suspect that anyone with normal corrected or natural vision could not figure that out without at least a strong magnifying glass. Even with one, I found the effort formidably eye-straining—and unsuccessful. I put the chart on the scanner, cropped down to at least a repeat's worth, and enlarged the image in Photoshop. Frankly, this is an extreme measure, but I had the tools so I had a go at it. The contents were still beyond my reach. So I asked my daughter for help. She's more proficient with Photoshop. I hoped she could shift the colors enough to improve the contrast. I was only looking at two-color design. If one set of squares could be one color and the other could be another color that was clearly different from the first, I'd be set. However, because that section of the chart was composed of two very closely related colors, each made up of tiny dots of the standard four inks of offset printing (CMYK), she had trouble isolating two distinct shades. I sketched the lower-body design motif on graph paper, transferred the resulting unit into Stitch Painter Gold, and finally printed out a version I could read while I was holding yarn and needles. Often I just use my penciled graph-paper notes to knit from, but I knew I'd be changing increase rates and going through other shenanigans with this sweater and I wanted electronic assistance in making, and revising, my working sheets. I'm also hard on my knitting notes. It's nice to be able to print out fresh copies. I decided to ignore the upper-body patterning for the time being. I wouldn't need the patterning for that part of the sweater until I reached the armholes. Here's a picture that shows the working parts for getting this sweater off the page and into yarn. The grayish paper is the enlarged and color-shifted chart that my daughter electronically modified from a scan of the book page. The lighter paper is my StitchPainter print-out for the sleeves, with repeats marked, increase rows indicated, and pink sticky notes placed above the most recently completed round. The index card under the chocolate-covered raisins contains the border pattern, hand-drawn, that got the work launched. I worked gauge swatches. The original sweater was at 6.75 inches and 8 rows to the inch. Mine would be 6.5 stitches and 7 rows to the inch. I was basing my calculations on the original's size small, which the pattern says has a 40-inch (102 cm) total circumference. I calculated revised stitch counts for the body and figured out how I'd set in the pattern repeats so they'd be symmetrical. I knew everything I needed in order to get to the underarm. I began to knit. I started with the body and worked a hem section back-and-forth in black, then cast on my steek stitches and joined to work in the round and also started the color patterning. I liked the weight and hand of the fabric, and I liked the motifs and colors. After I got the body to the point where I would work the narrow bands just below the underarms, I drafted the sleeves so I could knit them to the same point. I calculated that the sleeves for the small-size original sweater were 23.25 inches (59 cm) across at their upper edges. Experience (backed up by resources like Knitting in the Old Way) suggested that those upper sleeves would be deeper than I'd want, even for a jacket. So through highly technical means (I held a tape measure to my body), I decided that about 20 inches (51 cm) would work better and adjusted the increase rate on the sleeves to make that happen. First, it was summer and I now had three pieces of sweater that were about to be joined into a large lapful of warm wool. Second, I was about to need to knit the upper body. While the patterning on the original upper-body section is lovely—especially the way the front and back are slightly different in their centers—the front bit wouldn't work for a cardigan. Plus I'd changed the stitch count, of course. Instead of trying to pull the designer's concepts out of more hard-to-read charts and adapt them to my structural changes and revised gauge, I planned to design my own upper-body patterning that retained the spirit of the original. Third, because I was making a cardigan I would soon have to make major stylistic decisions—other than just “steek for opening up front.” Specifically, I was about to have to decide on neckline shaping. That choice would be closely linked to my so-far-nonexistent ideas about a collar (or neckband, or whatever). Over the summer and early fall, I knitted other things while I contemplated crew necklines with mandarin-style collars, V necklines with shawl collars, some variation of the stand-up collar on the original, and other options. I have re-located all three existing pieces of the sweater. This was not as simple as it should have been. One sleeve was in a separate carry-around bag and didn't show up immediately. 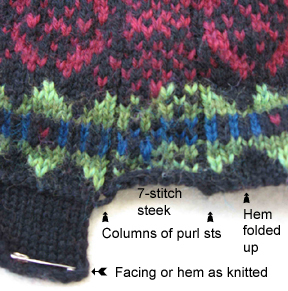 The photo shows a sleeve with the stitch markers indicating the repeats—I'd rather slip markers and know that each repeat is correct as it is finished than go back to fix a pattern that's gone astray. I know where all the balls of unknitted yarn are. I have put back on the body needle the stitches that had dropped off it. I've slipped all the stitches in the last re-picked-up round in order to make sure there are no split stitches. I could do this while knitting the first new round, but this requires less thought. Right now, that's good. My next step is to knit the narrow bands at the tops of the sleeves and of the body section. However, before I start those bands, I need to think further about how I plan to make this garment. The pattern in the book is not quite clear on how it intends the sleeves to be set into the armholes. I like shawl collars, so I'll probably end up with a small one. That means I need a V neckline. I will need to redraft the neckline opening and the armholes, in part because I'm at a slightly different gauge and in part because I've made the tops of my sleeves almost 4 inches (just under 10 cm) narrower than the original called for. THEN I will need to design the patterning for the upper body. The patterning on the lower body is geometric. On the upper body, the freeform motifs contain a lot of swirling lines. This contrast is one of the aspects of the original design that appeals to me. The original upper body contains birds and stylized flowers. I don't know what I will have. Of course, my patterning will need to be similarly designed so the stranding on the back doesn't require long carries. I want this to be a nice, compact, neat fabric. I have located my father's french curves (now old-fashioned drafting tools with all sorts of curving-line options) to play with when I get to that point. I have also printed out graph paper at the gauge of my sweater so I can experiment at actual size with the armhole shaping, the length of the upper body, and patterning options. 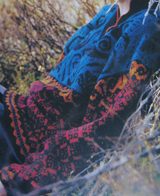 My primary resources for modifying sweater designs like this are Priscilla Gibson-Roberts' Knitting in the Old Way and Carmen Michelson and Mary-Ann Davis's The Knitter's Guide to Sweater Design. The latter is unfortunately out of print and hard to find; it's worth requesting through interlibrary loan when needed. KITOW is best for fundamental shaping and technical points. The Knitter's Guide contains how-to on the shapes of "fashion" styling. Both KITOW and The Knitter's Guide can look formidable if you think you have to understand the whole book at once. No, I don't have the information in them memorized! Far from it, even though I have had the honor and pleasure of editing both books, and of also publishing the most recent edition of KITOW (and of contributing some pieces to the text). I do rely on these books to help me figure out how to get to the next steps on many projects. So now I know where I was on this project when I set it down, as well as where I am now, and I have a rough sketch of where I'm going. I've re-located all the pieces. The only thing I need to decide right now is how I'm going to join the sleeves and the body, and how that decision fits in with the narrow pattern bands at the tops of the lower body and the sleeves. I'm almost ready to knit the next round. Whew, you weren't kidding last night! It was a pleasure to get to crawl around in your head as you work out a design though! Oh, I love this post! Thank you for letting us walk through your process with you. Some processes are hard to re-document having come out the other side. I'm sure I can not reconstruct my process for the self portrait, for example. For someone (me) who doesn't make many sweaters (and who LOVES this sort of scandinavian design), this post was truly delightful. Thanks.